Howe, then ASA Vice-President, led this expedition of 25 ASA members (Barranca del Cobre trip, 1960/n.d.). A Chihuahua newspaper published a report of the trip; Señor Oliv, the engineer who first mapped the Barrancas, met the group. ASA member Miriam Muehlenbach spent many years getting to know the Tarahumara in the Basihuare valley (Muehlenbach, 1973/n.d., 1974/n.d.). 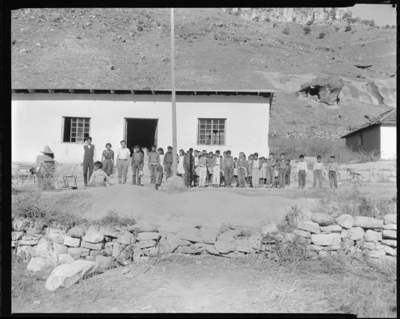 Indian children in schoolyard at Basihuare; scenic views of the surrounding area (ASA001-1273 is an empty enclosure – the negative had crumbled into tiny pieces and was discarded).